For too long the tuition fees debate has been mired in confusion. Perhaps the only uncontentious achievement of past governments regarding university tuition fees is to have structured them in such a way that it practically requires a degree to make any sense of it. The most recent turn in the perplexing debate comes as Labour leader Ed Miliband announced plans to cut the annual tuition fees cap from £9,000 to £6,000 and make richer graduates pay more back, in a bid to reduce debt on students and taxpayers alike. The ostensible contradiction between those two aims is one reason why the debate is so befuddled. Another is that tuition and maintenance debt (both covered by a student loan) is not much like the debt on a credit card or a mortgage. The amount you pay is 9 percent of your income over the respective thresholds, in effect raising the basic tax rate from 20 percent to 29 percent, or 40 percent to 49 percent on the higher rate, which starts on salaries of £31,866. What is more, the loan will be written off after a certain period of time. This depends when and where you took out the loan, but for a student in England or Wales today the cut-off is 25 years after you first become eligible for repayment, meaning many would be debt free by the age of 50 regardless of their career success. As some have pointed out, these conditions makes student loans less like loans and rather more like a kind of income tax modifier. The state pays all fees upfront and the student has no real obligation to pay it back. The problem, as former universities minister David Willetts pointed out on the BBC’s Daily Politics yesterday (12:40), is that the psychology of parents does not take account of much of the above, confusing much of the debate. Despite this the Independent Commission on Fees has however reported that the rise in fees this parliament has not deterred poorer students from applying, which does suggest that most students either understand the system or are blithe enough not to care about decades of “debt”. 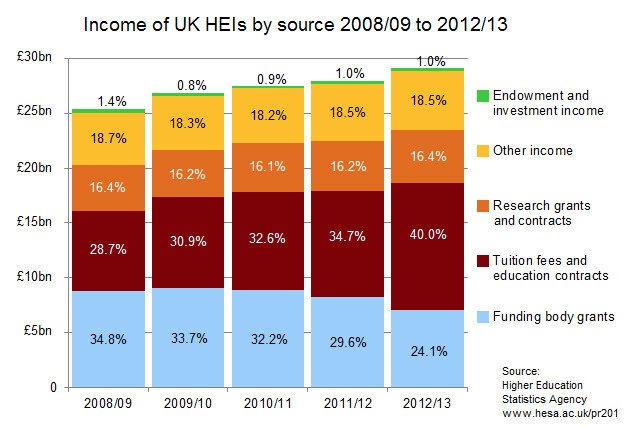 The other pressing issue is how universities will be funded if politicians rearrange the tuition fees. Almost all universities in Britain are publicly funded, drawing on contributions from the taxpayer, students and various other sources. Figures collected by the Higher Education Statistics Agency (HESA) showed that 40 percent of funding in the academic year 2012/2013 was derived from tuition fees, a figure that has steadily increased since the four previous years. The other categories shown in the chart include funding body grants (so far as the RD can tell, mostly government backed), as well as research grants and various other sources of income, which come from a mixture of charities, public bodies and corporates. Though funding for universities has been growing since the coalition government took over the numbers of students attending has also increased. Part of the reason tuition fees are so contentious is that structuring them poorly leads to more debt being written off, creating a de facto increase in taxpayer contributions to higher education. Deciding how we fund universities and apprenticeships would be a lot easier if the public understood how the system worked to start with. Right now the debate is being lost amid party politics. Don’t expect that to change any time soon.